Let’s face it. While Uber is generally awesome and is on track to disrupt the taxi business, the service is still too expensive for many consumers to use on a regular basis. The company dropped its prices in June after San Francisco-based taxis went on strike, but this was temporary. Today, Uber revealed that it is testing reduced rates in its San Francisco market. Comparing the test to the “golden ticket” from Willy Wonka and The Chocolate Factory, Uber says that a random 600 users in San Francisco will be able to access reduced rates (anywhere from 10%, 20% or 30%). If you’re in the test, you’ll automatically receive the reduced rates when using Uber with your account. Even a 20 to 30 percent discount could make a big difference in price and would probably make the service more appealing. It’s unclear how the economics on this will work out for Uber and its drivers. With the SF taxi strike, Uber’s drivers had to take a one-day pay cut. And Uber gave a cut of revenues the say of the strike back to the drivers to help make up the difference. It was more of a marketing stunt that didn’t really work out economically. But as Uber says in its post, this is a price elasticity test. So if the company lowers its prices, demand may increase among existing users and more money will be made on Uber rides. That will also mean more drivers, if usage goes up. 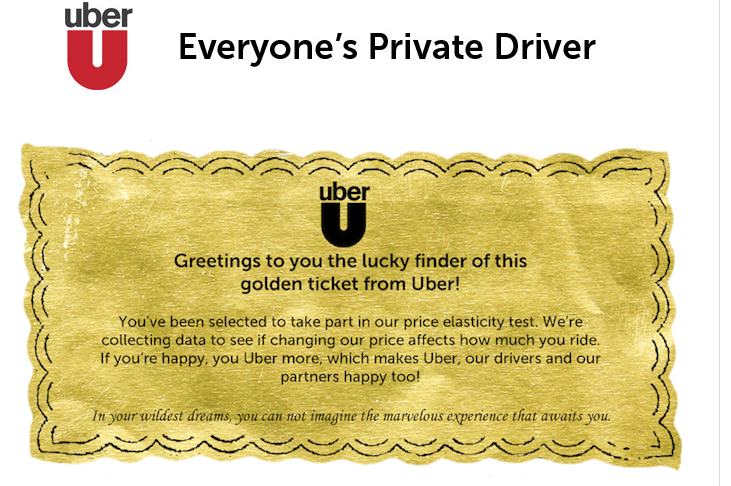 So, if you are an existing San Francisco Uber user, do you have a ‘golden ticket’? Have you received a discount?